The Best Spicy Tilapia Fish Deep Fried in Las Vegas is Cooked at Kung Fu Thai and Chinese Restaurant. We start off by taking a fresh whole Tilapia fish, which is descaled, cleaned and trimmed, before we sink it in our deep fryer filled with vegetable frying oil free of trans fat and no cholesterol, cooked until crisps, then smothered with our homeade authentic Thai roasted red chili based sauce with fresh Basil Mints. 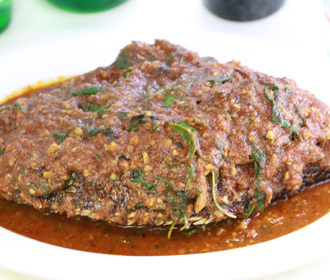 Delicious crispy deep-fried whole catfish served with a Roasted Chili Sauce.